My daughter, who is now five and a half (definitely not five), has discovered non-violent protest. When she’s aggrieved about something – or possibly just stropy – she now walks really, really slowly. And, clever girl that she is, she tends to engage in this disruptive behaviour when we need to actually go somewhere – generally when we’re late. 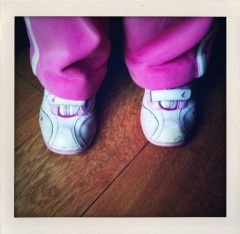 And she starts walking in tiny steps, an inch at a time. She’s like a protesting taxi-driver or French trucker. It’s both annoying and amusing at the same time. She may have been reading-up on this. I have sent a strongly-worded letter to Ben Kingsley. I say give her a taste of her own medicine. Slow medicine. Meh. Probably just beat her and lock her in the naughty box again. That was my next suggestion. Don’t forget the scorpions this time round.